Daniel Stover, 17, loads personal belongings from a friend's home flooded home in Sorrento, La., Aug. 20, 2016. A massive disaster recovery effort is underway in the southeastern state of Louisiana, as flood victims continue to clean homes, rebuild, and search for people who may have been trapped by widespread flooding. The flooding has been so powerful that caskets have been swept away from some cemeteries. The flooding, which the American Red Cross describes as the "the largest natural disaster to hit the United States since Superstorm Sandy," has claimed the lives of at least 13 people and damaged about 60,000 homes. More than 100,000 people have registered for federal aid. 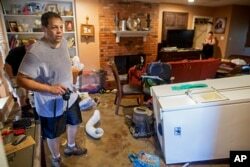 Raymond Lieteau takes photos his flood-damaged home in Baton Rouge, Louisiana, Aug. 16, 2016. Lieteau had more than five feet of water in his home. As people in the flood-ravaged areas attempt to recover from the disaster, many are wondering why they were not aware of the event's magnitude. Between August 8 and 14, nearly 27 trillion liters of rain fell on Louisiana, three times the amount rain produced by Hurricane Katrina in 2005, according to WeatherBell Analytics meteorologist Ryan Maue. University of Georgia atmospheric sciences professor Marshall Shepherd believes communications issues are the core reasons people were not aware. In an essay, Marshall writes that the storm system that produced the flooding did not have a name. "The American public is somewhat conditioned to perceive a named or higher-category storm as more of a threat." Shepherd writes that nomenclature could have also played a role. He cites that one National Oceanic Atmospheric Administration (NOAA) office described the storm as "sheared inland tropical depression," a phrase he says "is not going to resonate with the average citizen." He also believes a busy news cycle dominated by the fatal shooting of an African American man shot dead by a black police officer in Milwaukee, Wisconsin and the Olympics, coupled with reduced weekend newsroom staffing, were contributing factors. Because flooding happens more frequently than tornadoes and hurricanes, Shepherd says "such familiarity may shape perception of risk," even though he writes the National Weather Service warns that flooding and heat are the two most deadly weather events each year. As recovery efforts continue, so do damage assessments. The Federal Emergency Management Agency says it has already dispersed more than $34 million in aid. President Barack Obama is to visit the Louisiana town of Baton Rouge on Tuesday. The White House says Obama is eager to see the impact of the floods, but wants to make sure his presence does not "interfere with ongoing recovery efforts." Louisiana Commissioner of Administration Jay Dardenne said Saturday that state offices will be open in all parishes on Monday for the first time since the flooding started.